It’s a heist movie where the bank robbers are magicians and the detective is played by the Hulk, what more could you want? Now You See Me is obviously going to be compared to The Prestige upon its release and already is being compared on the internet which makes sense, The Prestige was also about magicians and is easily one of my favourite films of all time. You can’t deny that Now You See Me has a very ‘prestigy’ feel to it; what with the teleporting device, the magicians, the woman trapped in a tank of water and the appearance of Michael Caine but there is enough here to justify that it is a very different type of film. It looks, to me, that Now You See Me is a lot lighter than The Prestige, as it would have to be to gain the box office it must be expecting with a summer release date and a cast full of stars. I’m already looking forward to it. I enjoyed the trailer very much and Now You See Me looks like a fun film, that fun best summed up by Dave Franco’s half a second of trailer time in which he manages to fit in the trademark Franco smile. Eisenberg’s scene in which he escapes the handcuffs and gets them on to Ruffalo’s character is quick but incredible and it’s good to see they made the EVER so sensible choice of having Morgan Freeman do the voice over for the trailer. Bring on summer 2013! Christopher Nolan is an absolute genius. I love him as a director and a storyteller; every single one of his films, be it Memento, Inception or The Dark Knight trilogy are wonderful masterpieces of cinema and The Prestige is no different. Released in 2006, The Prestige is based on the 1995 novel of the same name written by Christopher Priest, the novel was adapted into a screenplay by Christopher and Jonathan Nolan. The Prestige is a very complicated telling of a very complex professional and personal rivalry of two magicians. As young aspiring magicians Robert Angier (Hugh Jackman) and Alfred Borden (Christian Bale) were friends and colleagues until a trick went wrong and Angier’s wife was killed. Angier blamed Borden for this as he suspects Borden tied an unbreakable knot around his wife’s wrists before a drowning trick. This leads to a rivalry that becomes an obsession for the both of them; each man obsesses with what the other man is doing and how he is doing it, both men sabotaging each other’s tricks in attempts to discredit or even murder their opponents. It is a deadly rivalry revolving around the greatest trick of all time: Borden’s Transported Man. Jackman and Bale lead the cast brilliantly. Bale is somewhat of an enigma to me where his acting skills are concerned, despite always putting in a solid performance I often feel as if he has more to give and that he is holding something back but as we move forward through The Prestige it becomes clear that Bale is giving his best. Scarlett Johansson is the lead female playing the beautiful assistant to Angier, then Borden, Olivia Wenscombe who becomes both a pawn and a player within their games. I think that Olivia is an example of Nolan not really knowing entirely what to do with female characters as she seems to lack the motivation the two male leads are given and she often comes across as just a lovesick blonde. The remaining supporting cast consists of Michael Caine, Andy Serkis and David Bowie who perform very well as you would expect (maybe not of Bowie but he proves he has a talent for this). Alfred Borden and Robert Angier are wonderful characters. They are both completely believable and Nolan does a great job of blurring the lines of morality between the two; neither are wholly good or wholly bad and I believe that the audience can choose which side to take (perhaps only after sitting through multiple viewings though). The Prestige is told in a non-linear fashion and shoots back and forth between the present day and the past as the characters attempt to discover each other’s secrets through reading their diaries. The plots then come together and once they do the film really draws to a perfect finale. 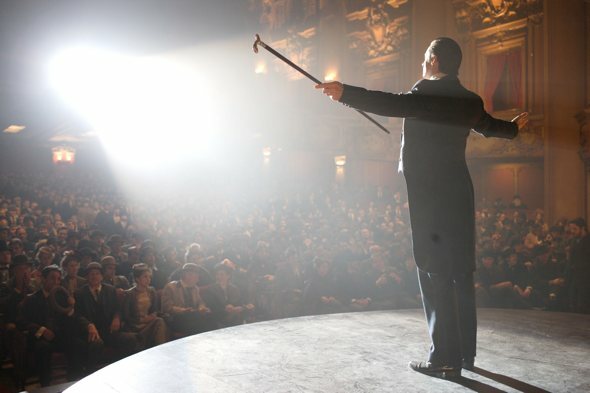 The final act, or ‘the prestige’, of Nolan’s phenomenal film has more twists than a bag of pretzels, each one being more significant than the last. The rewatchability factor of The Prestige is right up there. Watching over and over again you see more and more clues that give away the ending which you don’t see the first time round because “you’re not really looking. You don’t really want to work it out. You want to be fooled”. The whole film is layered in foreshadowing, clue after clue to what the ending is working towards but if you don’t know then you won’t see it coming, you won’t work it out no matter how much you let your mind run wild yet it is so simple. The Prestige may get forgotten about among Nolan’s works next to the originality of Memento and Inception and the hype around The Dark Knight but seriously, this is a perfect example of a story being told to the best it can be. Nolan proves himself to be a true magician behind the camera with this film carved into his very own magic trick: the Pledge, the Turn and finally, the hardest part of all, the Prestige.